Running an online store isn’t just about selling your items or products. It’s also about shipping/delivering your items to your customers. Having poor shipping practices will cause customers to turn their back on your business. No matter if you have the greatest products in the world. Having quality shipping methods is a stellar opportunity to build customer trust and create customer loyalty. There are several different options for you to choose from as a retailer trying to gain customer loyalty. You can offer free shipping, flat-rate shipping, real-cost shipping, or same day delivery. Free shipping is, of course, a customer favorite. Depending on what your shipping cost, this could be beneficial to you as well. Especially if your competition is not offering free shipping on the same item. This gives you the advantage in the customer’s eyes and ultimately builds that loyalty you were hoping for. Flat-rate shipping is a more simple option for owners, as it is a price set by you for your business. Most customers know the shipping rate before even making their purchase. This option is best if your products, packaging and shipping costs don’t vary much. Real-cost shipping is a more cost efficient option for you as a business owner. This is charging customers the precise cost of shipping of the product they are purchasing (size, weight, and destination). This might not be the customers favorite option, but it does keep you from paying for larger products shipping. Same-day delivery is more of an option for locals and a huge selling point for holidays or events. This is a more time consuming option, though. You have to get with a local delivery company and coordinate pick up and drop off. Your e-commerce platform might not offer this option, so you could have to customize your platform. 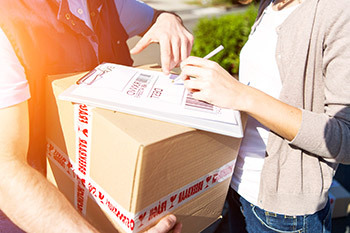 What shipping delivery option you choose as a business owner typically depends on three factors: product size and weight, shipping destinations and shipping options. The size and weight determine the price of the shipping, and usually have the biggest impact on which type of shipping you plan to do. Shipping items under 1 pound have a flat rate across the country. The larger the item gets, the more shipping will cost. Shipping destinations go hand in hand with the size and weight when it comes down to the cost. There are 8 zones that carriers use to determine the rates of the shipping. Zone 1, the closest zone to you, is the cheapest shipping cost. Zone 8, the furthest from you, the most expensive shipping. This is great for shipping throughout the country. There are several shipping options for you to choose from as a business owner. You can find local delivery companies that’ll deliver to your local customers much quicker than the big carriers can. Some of the top shipping options for your e-commerce site are: free in-store pickup, same day delivery, free shipping. This is great for smaller companies who have the resources to do this, it makes your customers feel appreciated. Everything you do, every move you make, every step you take, they will be watching you. Therefore, building brand loyalty and creating repeat customers will help your business to flourish.